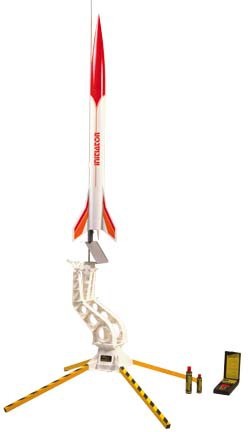 This is the Initiator Model Rocket Starter Set from Aerotech. Retail $269.99 SAVE 9% ! Contains almost everything needed to enter the world of advanced model rocketry. The complete introduction to advanced model rocketry. -39" long tip to tail. -Precision airfoil fins molded of durable polymer. -Labyrinth ejection gas cooling system. -Tangle free shock cord mount. -One piece molded nose cone. -Key-Eject safety key ejection system. -Interlock igniter clip for Copperhead igniter. -40 feet of power cord. -Battery clips for 12 volt battery. -Elevated rocket positioning for easy igniter hook-up. -Molded in Aerospace White polymer. -Two piece threaded 4.75 x 1/4" launch rod. -Adapter for 1/8" and 3/16" launch rods. One Initiator Model Rocket Starter Set. I eagerly opened the box and assembled the Mantis, Interlock, and Initiator within 24 hours of receiving. Overall impressions: Mantis - Overall, the pad went together smoothly. Dial control on launch angle is a great feature. Legs are removable and the whole contraption fits within my field box nicely. It does pack up well. My only gripe is that the launch rod holder should be redesigned. To change launch rods, you have to remove two screws/washers/wing nuts. The Screws are barely long enough and the wingnuts/washers are prone to getting lost in the grass. Once these are removed, you must rotate a two piece disk to the correct diameter rod. While the disk has alignment keys, it must separate enough to get the rod in place and you lose the alignment. Also, the openings for the launch rods seem to be undersized too much. I understand you want it slightly undersized to grip, but this goes a bit too far. I&apos;ll be finding longer screws, reshaping the disk, and coming up with some better way to keep the alignment of the two disks. Other than this, the pad is great! One more item, all of the photo&apos;s show the legs with a nifty yellow/black striped scheme. This is not the case with what you get. The instructions indicate that it is up to the end user to paint this. I&apos;ll probably find some alternating color electrical tape for mine. Interlock - On the plus side, this works really well. I&apos;m used to the Estes controller, and I&apos;m far more confident with the 12 V supply, heavier cables, beefier box, etc. On the negative side, I have now seen what is inside the plastic controller and am feeling a bit let down. I was hoping for higher quality sealed switches, a more reliable continuity checker other than a voltage drop across a buzzer, and overall a better build. This is similar to the Estes boxes in that it relies on the voltage drop across a buzzer (vs. a light bulb for Estes) to not set off the igniter during the continuity check. This has always made me nervous in that I don&apos;t always believe that the igniters are the most reliable. I bought this to use with all igniters hoping it would be a rock solid system with a very low current continuity check for added safety. The buzzer draws 20 mA, which has not set off an igniter by mistake for me yet, but still makes me nervous. I realize that most small ignitors require hundreds of mA to produce a bare minimum to ignite, and this is probably an unfounded worry. However, it wouldn&apos;t take much to push several uA, sense it, then trigger the buzzer. Finally, the switches within the unit are simply copper or brass plates that mechanically fit within plastic buttons. I was hoping for sealed switches with better contacts. Again, this puts this on par with the Estes box. However, it looks and feels much better. Despite all my gripes, it works and works well. Initiator - Awesome rocket to build. Goes together like a snap. Flies great. I&apos;ve been using the smaller motors simply to make sure I find it. Recommended for Ages 16 and Over with Adult Supervision. Read enclosed instructions before use of any package components. Follow the National Association of Rocketry Safety Code when flying your model rockets. Keep rocket motors out of reach of small children.